Outline how initiation of translation takes place. State the name and function of the tRNA binding sites on ribosomes. Describe the repeated cycle of events that occur during synthesis of the polypeptide chain. Outline how the disassembly of the translation components leads to termination of the process. Use molecular visualisation software to analyse the structure of eukaryotic ribosomes and a tRNA molecule. Explain how tRNA-activating enzymes illustrate enzyme–substrate specificity. Explain the role of phosphorylation in binding of amino acids to tRNA molecules. Outline that free ribosomes synthesise proteins for use primarily within the cell. Outline that bound ribosomes synthesise proteins primarily for secretion or for use in lysosomes. Outline that translation can occur immediately after transcription in prokaryotes, due to the absence of a nuclear membrane. Identify polysomes in electron micrographs of prokaryotes and eukaryotes. Outline that the sequence and number of amino acids in the polypeptide is the primary structure. 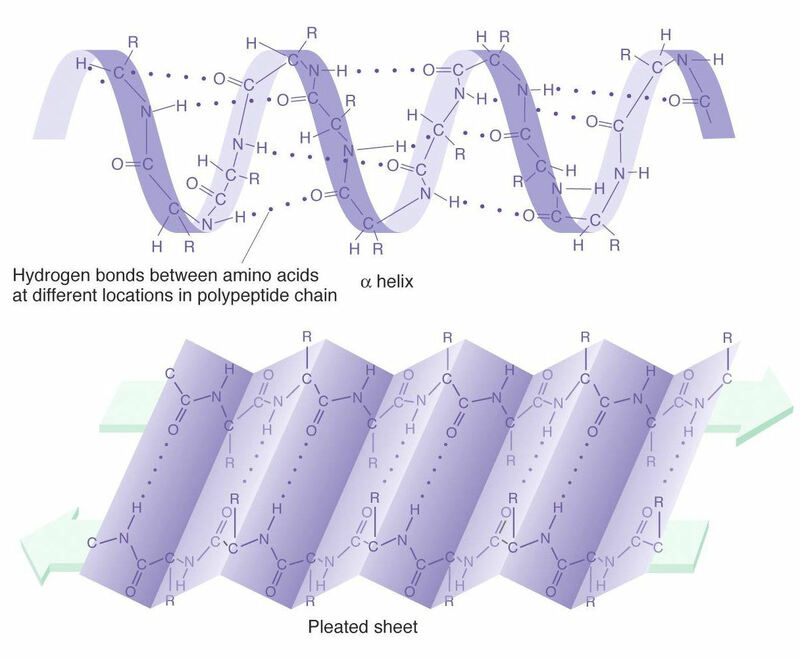 Outline that the secondary structure is the formation of alpha helices and beta pleated sheets, stabilised by hydrogen bonding. Outline that the tertiary structure is the further folding of the polypeptide, stabilised by interactions between R groups. Outline that the quaternary structure exists in proteins with more than one polypeptide chain. Objectives: know the three steps of translation and how they are triggered. describe how the primary, secondary, tertiary and quaternary structure of proteins is derived. P and A sites on a ribosome: The spaces occupied by two tRNA molecules. The amino acid from the tRNA molecule is transferred from the tRNA at the P site, to the growing chain at the A site. 1)Initiation. Initiation of translation comes as a response to a ‘start codon’, which is often AUG (memory trigger, schools begin in August). The amino acid met (methionine) binds to the start codon to begin translation. 2) Elongation. The growing chain of amino acids joined together by polypeptides forms. As we will see later, often a protein is formed of more than one polypeptide chain. The binding sitre for mRNA is on the small ribosome sub-unit. E site – exit site. This position is occupied by the tRNA molecule that is leaving, having contributed an amino acid to the growing amino acid chain. Describing the structure of such subtlety complex molecules of proteins presents a challenge. Look at haemoglobin for example, a transport protein that binds to four molecules of oxygen. Red blood cells (erythrocytes), contain 250 million molecules of haemoglobin (so how much oxygen?). It is composed of four different polypeptide chains, all folded tightly on themselves, and compacted together to produce a ‘globular shape’. This dense shape, and the presence of polar groups on the outside of the molecule, account for the solubility of haemoglobin. How could you describe the structure of haemoglobin in a systematic way? 1. Primary structure: Primary structure deals with the basic amino acid sequence. It can spiral, forming a helix, this is called an alpha helix. Or it can fold on itself at regular intervals, this is called a B-pleated sheet. 3. Tertiary structure: The polypeptide chain can fold on itself, forming specific bonds to hold this new configuration. Bonds: include so called sulphur bridges, which are covalent bonds formed between sulphur molecules. This makes amino acids that contain sulphur, e.g.. methionine, important for tertiary structure. 4. Quarternary structure: More than one polypeptide chain can be involved. 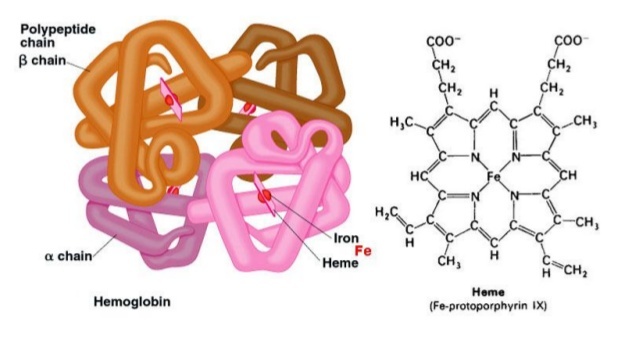 In haemoglobin, four polypeptide chains are involved, 2 alpha chains, and 2 beta chains. Q) What is the difference between the alpha and beta chains? 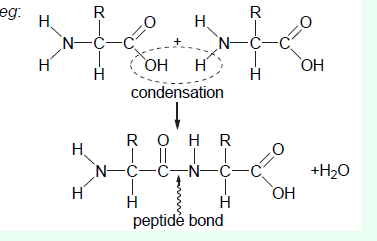 Draw molecular diagrams to show the condensation reaction between two amino acids to form a dipeptide. mp a requires the double bond to be shown between the C and O. 1b. Outline the roles of the different binding sites for tRNA on ribosomes during translation. Accept annotated diagrams of the sites.